E-commerce is steadily becoming an integral part of the FMCG sector. 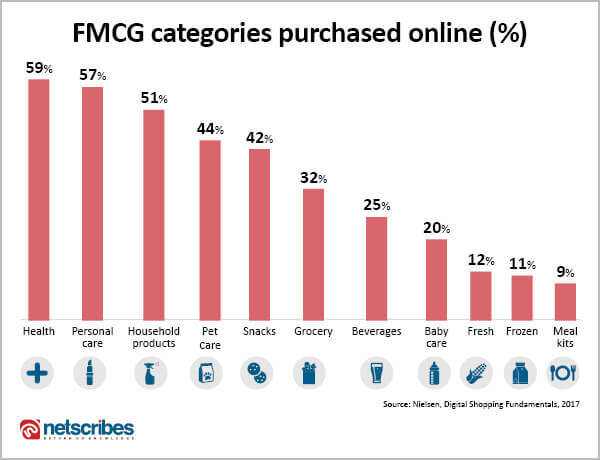 According to Nielsen, nearly nine out of 10 dollars of FMCG retail growth came from online channels over 2016-17. A number of categories, such as edible goods, personal care, healthcare, and pet care are witnessing dramatic e-commerce growth in major markets such as the US, UK, China, Japan, South Korea, and India. As FMCG brands veer their business strategies towards digital, understanding how consumers shop for products online is paramount in order to stand out from the competition and increase market share. With e-commerce claiming a global share of 36 % in FMCG growth, today’s digitally-evolved customers are compelling brands to explore newer ways to sell. The marketing playbook for FMCG sector has changed. The ex-head of Walmart’s mobile and digital vertical, Gibu Thomas mentioned facing skepticism about e-commerce and mobile purchases in the nascent years of his tenure. Today, Walmart is among the top e-commerce retailer in the US after Amazon. Much like Walmart, incumbents will have no choice but to grab the proverbial bull by its horns and ride on the e-commerce tide in order to stay relevant. Consumer purchasing patterns online and in-store are starkly different. Packaged goods make up for a large chunk of online purchases, while fresh produce, meat, and dairy are categories that people prefer purchasing after an in-person check at stores. Nielsen’s report further drills down to reveal that longer shelf-life categories like medicines and beauty products top the list along with pet food and pet care products. Baby products too, are gaining momentum online. The food and beverage category has been showing a lot of promise in online retail. Global market research provider Euromonitor International predicts that F&B will experience the fastest growth at 80% through 2022. In fact, this category is expected to touch the $20 billion mark this year itself. The study also predicts that, in established e-commerce markets such as the UK, the food and beverage category will claim for one-fifth of the total online sales in 2018. Popular online product categories, however, vary by geography. According to e-commerce analytics firm OneClick Retail, beverages make up a majority of Amazon’s grocery sales in the US; coffee being a consistent bestseller. 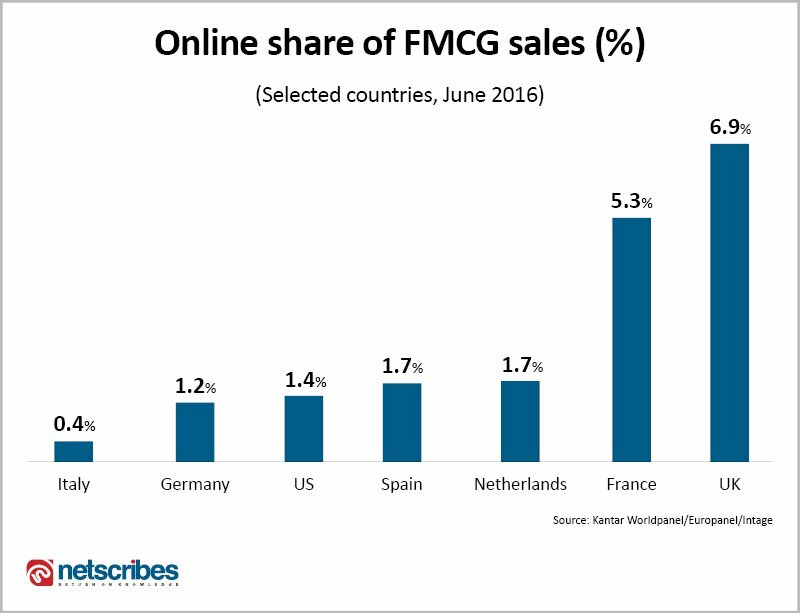 On the other hand, Health & Personal Care products make a majority of Amazon’s FMCG market in the UK. 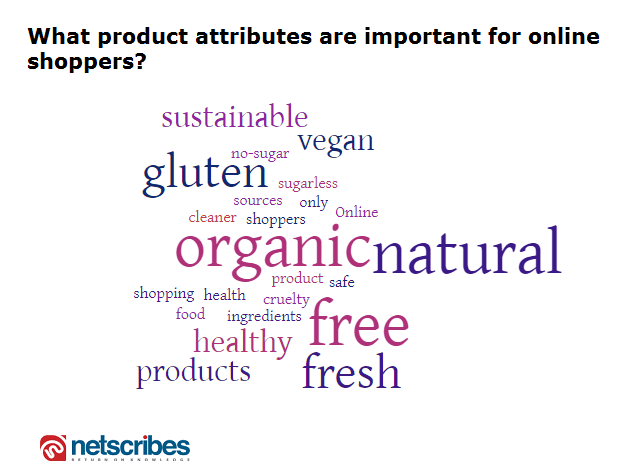 Online shoppers are more conscious of the brands they patronize and its contribution to the environment. In fact, according to a Nielsen study, health and sustainable product shoppers are 67% more digitally engaged than the average US shopper. 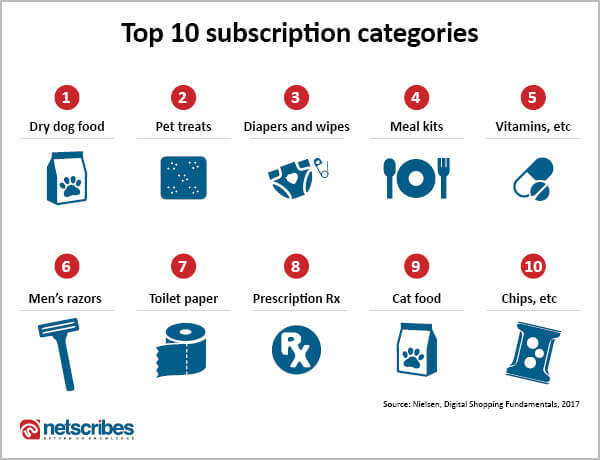 Subscription services are yet another alluring hook proliferating the FMCG industry. Research shows that customers often re-order the same products from past purchases and it’s giving rise to subscription-based grocery shopping in many markets like Japan, India, and the US. For FMCG companies, such markets are important for building brand loyalty and are giving rise to innovative new entrants vying for market share. 18% of online purchases in the US are based on subscriptions, including 30% of health and 29% of personal-care purchases. While non-food categories have generally dominated this service, snacks and meal-kits are slowly making it to these lists. A growing number of people prefer shopping on mobile apps than on desktops. 40% of all online grocery purchases in the UK are made on mobile. Being a mature market, e-commerce consumers in the UK buy fresh produce as often as they buy packaged products. Buying online and picking up at the nearest curb. Order groceries online and having them home delivered. 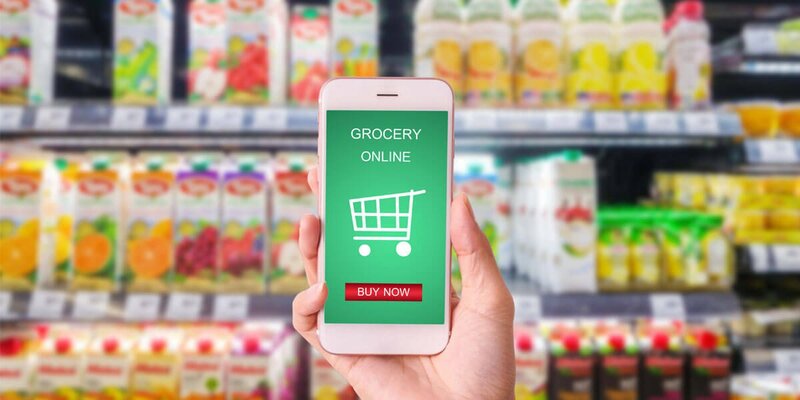 As competition grows, we expect to see the FMCG industry adopt innovative technologies to improve the shopping experience for customers and create new ways to shop. Major retailers are already implementing advanced technologies to build a competitive edge. For example, Amazon’s Echo, the adoption of payment technologies, chatbots. A large number of grocers, both online and brick and mortar, are using their vast stores of customer data to personalize offers. With shoppers constantly turning to their phones for every light-bulb moment, the Amazon Dash Wand makes for an excellent assistant in tow with Alexa. Equipped with a barcode scanner and voice recognition technology shoppers can add to their list by simply scanning or dictating the item name. Leveraging on China’s social media engagement, e-commerce giant JD.com collaborated with WeChat to allow users to browse merchandise while texting. Machine learning technologies will soon be able to spell out your favorite brands that have discounts the moment you step into a store or cite a pop-up on the app. Mixed Reality instances by Lowe’s Vision and GAP are already setting the pace for a cohesive in-store and online experience. From drone-based deliveries to guiding customers through the aisles based on their shopping lists using mixed reality, the digital boom in FMCG is closer than we may think. When it comes to seamless transactions, Facebook has filed a patent application leading the way with facial recognition to conduct retail payments. The next frontier of digital technology could see IoT-based technologies scanning kitchen cabinets, making autonomous lists, ordering subscriptions, all making grocery shopping a no-shopping experience. The rise of digital is changing the way consumers discover and shop for products while creating new opportunities for growth in the FMCG industry. In order to capitalize on these opportunities, FMCG brands will need to expand their digital capabilities. At the same time, they will have to adapt to customers’ evolving purchase patterns and competitive landscape influenced by new technologies. Netscribes helps brands in the FMCG industry create a competitive edge by providing custom market intelligence and e-commerce content services. To know more, write to us at [email protected].